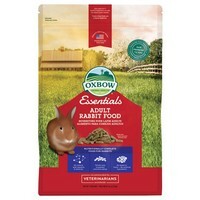 Oxbow Essentials Adult Rabbit Food is a complete and balanced diet, designed to meet your pet’s unique nutritional needs. Made using Timothy grass meal, plus basic vitamins and minerals, Oxbows Essential Rabbit Food combines needed fibre with stabilised nutrients to create a delicious meal that focuses on your rabbit’s overall health. I'm in the process of changing both my rabbits onto this food and so far they seem to really like it! I feel it is more nutritionally balanced than some other pellets: it's high fibre, but you also don't have to feed a lot per day for them to meet their nutritional requirements. I prefer to feed mainly hay and keep pellets as a very small part of their diet, so it's good to be sure they're still getting all the vitamins they need. An excellent pellet that is high in fibre, which is essential for healthy gut function. My vet recommended this food to me because of the high-fibre content, which is lacking in many other rabbit foods. My rabbits love it and because it's a pellet, they can't selectively feed like they would with a muesli food.